At Unique Refinishers, Inc., we are proud of being the oldest and largest refinishing company in the country. We have more than 50 years of experience in this industry and have had the opportunity to work with commercial and residential clients for decades. Because of this long history, we’ve worked on many different types of projects and can say with confidence that we can restore any bathroom or sink to its original condition for an affordable price. We take pride in providing exceptional quality work. 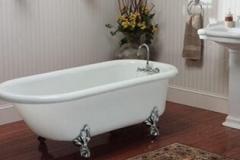 We can help you with your Jacuzzi tub, fix your ceramic tile, or install ADA-certified hardware for safety. Have more questions about our company? Just ask us!